I'm pretty sure it will likely be my mess up with the sdram freq. I'll check the config.txt when I get home. I'm certain I originally copied the configurations from the pi1 when initially setting up the pi2 and then just changed the overclock values. It's quite possible that I missed this one. (2015-09-14, 12:49)popcornmix Wrote: Okay, for the gpu mem leak. Are subs essential? Playback of a tv show without any subs at all resulted in no leakage at all. Milhouse, popcornmix (and any other dev working on this), just want to say again that you guys are doing awesome work on RPi2. Thanks! I got problem about mouse pointer. Hardware mouse pointer doesn't exact position under input box. GUI key button highlighted but pointer stay previous position for a while(very long). I'm having an issue with the trakt add-on since build #0910. Basically, I have it configured to rate videos after watching. It shows a custom dialog to do so and then waits for the user to rate it or close the dialog. Since build #0910 the dialog is not shown, but the add-on thinks it is and then sits there indefinitely, so it basically stop working (scrobble, manual sync, etc. It really is waiting for the dialog). GUI is fully usable as no dialog is shown at all. It might need a few tries to reproduce (you can fast forward near the end). Never used trakt before, I'll try installing it later today. Complete guess, but could it be PR7800? 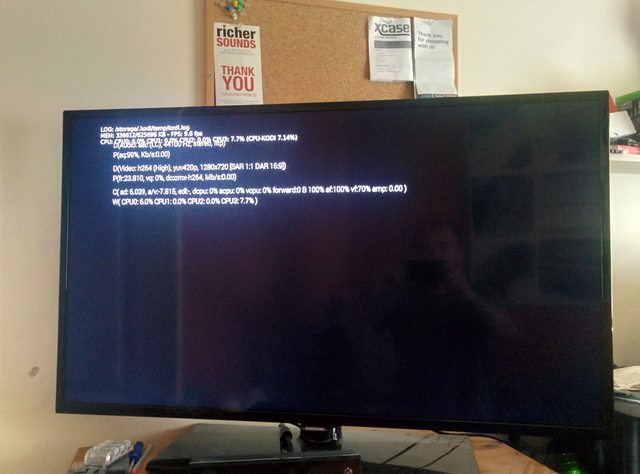 (2015-09-14, 15:03)popcornmix Wrote: Can you test on another kodi platform? E.g. a nightly build on windows or linux. Would be useful to know if it's an upstream kodi issue. (2015-09-15, 04:22)menakite Wrote: I'm having an issue with the trakt add-on since build #0910. Looks like the significant commits were all merges to kodi master. Can you reproduce it on another kodi platform. E.g. nightly build on windows/linux? I've rebuilt #0910 and reproduced the issue. I then reverted PR7800, rebuilt #0910, and now the trakt rating is working. The only difference between the two builds being the presence or omission of PR7800. 11:43:07 89.064400 T:1838150656 DEBUG: [script.trakt] rating: Rating dialog was closed with no rating. The non-working version (with PR7800) seems to perform a "Window Deinit ()" on the Ratings dialog without actually displaying it, which presumably the add-on is unaware of and so it waits for input that never comes - either a bug introduced by PR7800, or a new behaviour in Kodi which the addon now needs to take account of? Debugging the call to gui.doModal(), it appears that in #0910a (ie. the non-working version) the gui.doModal() call succeeds, but doesn't display anything so at that point the add-on is "stuck" wiating for the gui.doModal() call to complete. With PR7800 included, the Kodi doModal() method appears to be defective, or has a different behaviour that now needs to be accounted for - ping @Paxxi ? Thought i had noticed it a couple of times but didn't think anything of it. If it gets stuck at the beginning of the file indefinetely I can seek forwards which will continue playback as normal. What is the best way to cut a sample file down. Now I'm not so sure weather I just have some damaged files.